WhereCampPDX is a free, annual unconference for people interested in geography and related technologies. 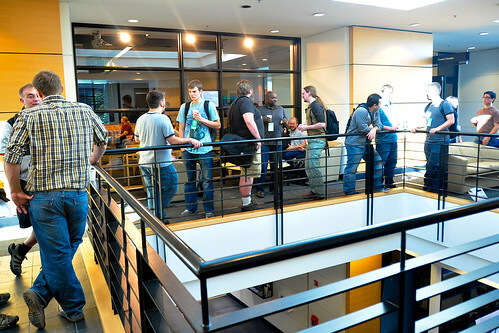 This year’s WhereCampPDX will be happening October 7-9 at Metro Regional Center and other Portland locations. WhereCamps are volunteer-created events for anyone interested in geography and technology. Everyone who is interested in these topics is invited to participate. An unconference is a conference planned by the participants. We come together in the morning and plan the sessions that will make up the day’s discussions and activities. This gives everyone an opportunity to bring the things that interest them the most to the table, ask questions, and talk about new and exploratory topics. We value open participation, providing access to new voices, and lowering barriers to participation. As a result, the event is driven by the interests and talents of the participants. To kick things off, we’ll be hosting an opening party on Friday night with food, drink, and casual geonerdery. On Saturday, the Metro Regional Center will once again host our unconference day from 10am to 6pm. Sunday activities will take place at various locations throughout central Portland and are being currently being scheduled. Follow the WhereCampPDX site for up to the minute details, and let us know if you have great ideas for Sunday activities. Get involved! Join our Google Group, add to the wiki, and above all, register! Share your interest on Twitter, Facebook, Google+, or your favorite social network! RSVP on Plancast or Lanyrd! This entry was written by Reid Beels, posted on September 6, 2011 at 10:00 am, filed under Uncategorized. Bookmark the permalink. Follow any comments here with the RSS feed for this post. Both comments and trackbacks are currently closed.